Have you ever organised a poker tournament at home and wondered if there was a better way to keep track of the poker blind levels? Well, you don’t have to wonder anymore. If you have a personal computer or laptop on hand, you are in luck. There are many free poker tournament clocks out there you can use to enhance play. Here are three of the best of them. The Poker Timer is a full-featured, internet-based program that runs on Microsoft’s Internet Explorer for Windows. The program is super easy to install and packs all the essential features you need to effectively time you home poker tournament. There is a free and paid version of the program. The free version is fully functional, but you will get a 'nag screen' for 90 seconds whenever you activate the program. The 'nag screen,' however, disappears for the rest of your tournament. The Poker Timer is quite handy if you are not looking for league or network poker tournament clock capabilities! The Tournament Director (TD) is a premier poker tournament clock and tournament manager. The full-featured program boasts a fully cusstomisable timer screen with tracking capabilities for players’ buyins, add-ons and seatings. Simply download the application for free and enjoy. You are, however, encouraged to make a small monetary donation to the author at least once a year if you find the program useful. The Tournament Director will meet all your timing needs in a home poker tournament. 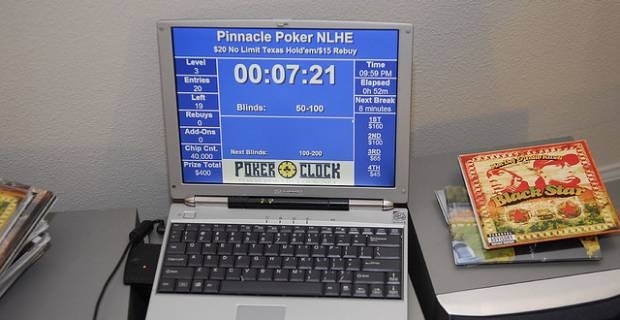 The Poker Clock is yet another of the excellent free poker tournament clocks for organizing any kind of poker tournament. 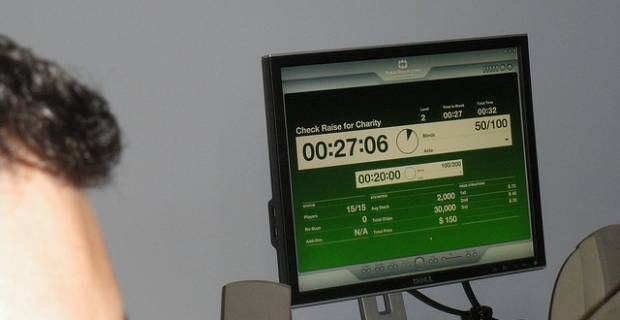 The free, web-based program is simple to install and use and also has a fully customisable timer screen. You can adjust the timer as desired in real-time to meet the exact needs of your tournament, whether it is a small home poker tournament or a larger tournament event with many participants. Quite a joy to use, really.